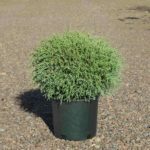 A dwarf, rounded shrub with lacy, soft green foliage. The foliage is soft to the touch. It prefers a site in full sun to part shade with a moist, well-drained soil. It is useful for low hedges or foundation plantings where space is limited.